March is National Credit Education Month, which is a great reminder to self-assess our financial goals. Where do you want to be in 5, 10 or even 20 years from now? It’s never too early to start thinking about the future. Whether you are in the early stages of setting goals or in the process of executing a well thought out plan, it’s important to do annual evaluations of your credit. First and foremost, did you know you are entitled by law to a free annual credit report from each of the nationwide consumer reporting agencies? Taking advantage of this service is a great way to make sure you are not a victim of identity theft. If you are planning to make a large purchase soon (like a home) it’s a good idea to check all 3 reporting agencies at once to make sure there is nothing looming you are unaware of. If you are not planning to make any purchases soon, it might be best to check them one at a time approximately every 4 months as a way to make sure your identity hasn’t been stolen. Many people think of credit cards when they think of credit, but there are other ways to have access to credit or to establish and build credit. Anytime you borrow money such as credit cards, vehicle loans, home loans, etc., you are establishing credit. It probably goes without saying that making timely payments also goes a long way towards building your credit and that slow payments will have an adverse outcome. Many institutions have a late fee after 10 days and report payments more than 30 days late to the reporting agencies. If your finances leave a little to be desired, consider by starting with a simple budget. Make a list of all your outgoing payments and subtract that dollar amount from the total of your income. Don’t forget to list things that don’t come in the form of a bill such as a budget for groceries, gas or monthly entertainment. If your expenses are greater than your income, look for ways to cut back, such as eating out less or getting rid of cable. You could also consider a second job until you are able to pay off some debt. If you have credit card debt, prioritize paying it off as soon as possible. If you have multiple credit cards, list them in order from the largest balance to the smallest balance. For this technique, don’t worry about the interest rates. Focus on the smallest balance first, paying any additional amount you can above the minimum payment. Once that card is paid off, roll the entire payment you were making into the payment of your next smallest balance. This should be added above and beyond the minimum payment you were already making. Continue this method until all of your credit cards are paid off. This is a great way to pay off your credit card balances faster! Kyle Thompson began his professional career as a broadcaster in the Emporia area. He has hosted a morning show, various day shifts and anchored local news. 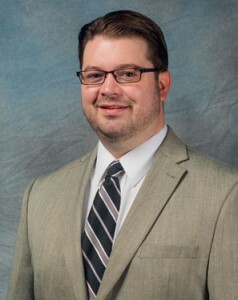 He joined Lyon County State Bank in 2014 after graduating from Emporia State University. Kyle specializes in commercial and consumer lending.